Just four years ago, the Ümran Baradan Toy Museum opened its doors to anyone young enough to enjoy the toys on display and old enough to take a nostalgic journey into the past. 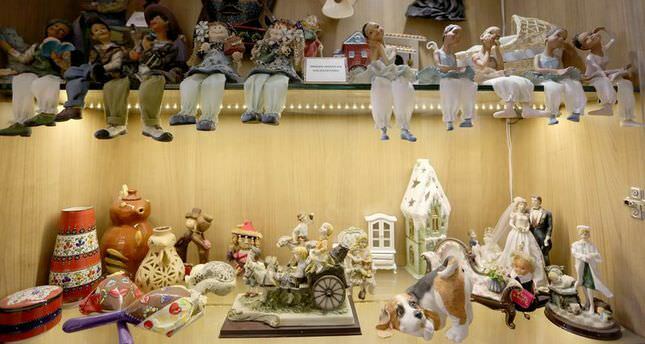 Situated in İzmir's Konak district, the museum has more than 1,000 unique toys in its collection, most of which were purchased in various countries by the late prominent ceramic artist Ümran Baradan. Aiming to transfer nostalgic games and toys into the future, the museum offers a colorful and entertaining visit to the world of fairy tale characters. Baradan donated her collection and a two-story house to establish the museum back in 2005. Five years later, poet and author Sunay Akın, the founder of the Istanbul Toy Museum, offered some of his historical toys. Going back 200 years, the toy collection draws more interest in the winter months, a great weekend activity that can be enjoyed by the whole family. Toy museums fill an important gap in the development of children in which they entertain themselves while learning more about history. The İzmir-based museum showcases limited edition toys designed by the world's early toy companies. One-hundred-fifty- year-old baby carriages (U.S.), 80-year-old porcelain dolls (Germany) and dollhouses that enhance children's imaginary world - although they were less frequently produced - are among the most popular toys. Dating back to the 1800s, another toy with the head of a horse is one of the museum's oldest pieces. Information cards are available to learn not only the story of toys, but also the economic and social structure of their period. A small note is attached to a doll that says, "human-hair was used." The note goes on to say that in the 1930s, poor European families used to sell their daughters' hair to earn money. Similarly, the toy called "Noah's Ark" sheds light on the Victorian period. In those times, English children were not allowed to play with any other toy on Sunday's for religious reasons. The museum also displays toys made by the Japanese after World War II. Powered with batteries, the luminous toys cornered the market. The museum's interior design displays a visual fest that bring to mind old street games. Little children are invited to develop their background with regard to traditional Turkish plays. On weekends, a number of events take place, from the shadow play of Karagöz and Hacivat to puppet workshops. Children generally leave the museum with bittersweet joy, as they either want to spend more time there or take the toys home. Speaking to an Anadolu Agency reporter, seven-year-old Ada Turan said that after she visited the İzmir Toy Museum for the first time she liked because she was "surrounded by historical toys." Turan mostly enjoyed dollhouses. "I do not have a doll house, but I wish I had one," she continued. The little visitor said she would take all of the toys if she had the chance. Likewise, five-year-old Alper Tunga Akınlar visited the toy museum for the first time. Although he has lots of toys at home, the toys at the museum look "more beautiful." His mother, Gülsüm Akınlar, said they went to İzmir to visit her mother and took her son to the museum later. "There are many interesting toys in the museum. Although I came here for my son, I returned to my childhood when I saw cloth dolls and Karagöz and Hacivat. Before I came here, I thought there were only toys from recent times," she concluded.